The Elphinstone Cougars took full advantage of their extra day of rest, the played with more poise and more energy than the STA FIghting Saints who were playing their 3rd game in three nights and cruised to a 71-54 victory to win the 2014 AA Howe Sound Championship. In each of the previous two games STA surrendered an early lead in the first quarter and were able to quickly come back and even things out before the end of the first half. This was not the case tonight as the Fighting Saints trailed by 15 points at the end of the first quarter. Elphinstone maintained a very consistent work ethic throughout the game, and never gave the Fighting Saints a window to mount a comeback. The Cougars led by 24 at the half, and STA could not close the gap in the second half. The Howe Sound double knock out format lived up to its billing as one of the toughest tournaments in the Province. The Cougars took full advantage of their extra day of rest and were able cruise to victory. "I am so happy of these kids, many of them have put in five years of really hard work to get to this game and it looks like it paid off for us in the end," said Elphinstone coach Michael Sopow after the win. TJ Turenne had another every strong game for Elphinstone controlling the offensive tempo and putting in great effort at the defensive end of the floor. Turenne finished with 18 points and was selected Tournament MVP. The diminutive Alex Loitz had another very strong game with 14 points and was selected the NO REGRETS Player of the Final Game. STA was once again led by the backcourt tandem of Mico Carrion and Christian Diego who had 24 and 10 points respectively. Carrion and Diego were selected to the Tournament All-Star team along with team mate Conrad Tomaszkiewicz. Nathan Haglund and Nolan LeWarne both from Elphinstone rounded out the Tournament All-Star Team. Elphinstone and STA both qualified for the AA Provincial Tournament which will be held in Langley later this month. FIGHTING SAINTS PUNCH TICKET TO THE DANCE WITH VICTORY OVER BODWELL. 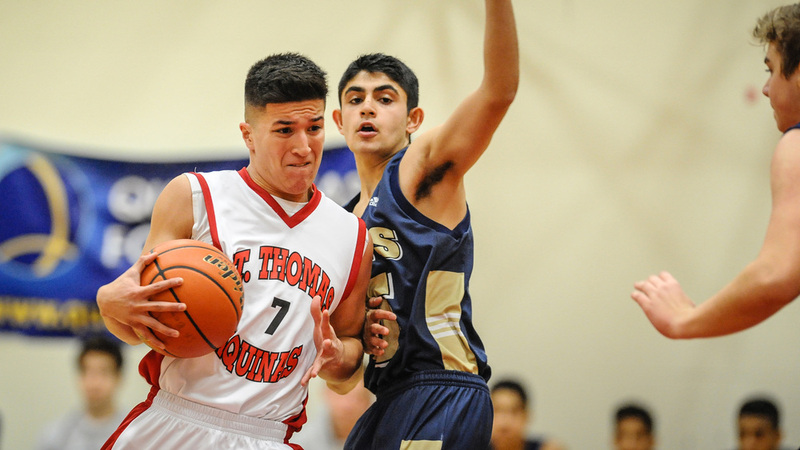 The Saint Thomas Aquinas Fighting Saints captured the second North Shore berth in the AA Provincial Championships with a 75-63 victory over the Bodwell Bruins in tonight's sudden death game in the Howe Sound Tournament. The Fighting Saints will now play the Elphinstone Cougars in tomorrow night's Howe Sound FInal. Bodwell got off to a fast start in the first quarter, but the Saints found their rhythm and the game was tied at 16 after the first quarter. Christian Diego of STA started to heat up in the second corner hitting 5 3's as STA took a 37-30 lead to the locker took at halftime. After the break STA was able to build on their lead, and increased the margin to as many as 11 points before Bodwell put together a 14-0 run and took a 53-49 lead at the end of the second quarter. The game remained close for most of the 4th quarter when it started raining 3's in the STA gym! Christian Diego put on a show draining a school record eleven 3 pointers in total but Bodwell continued to fight back and the Bruins pulled to within 4 with two and a half minutes remaining. But that was as close as they would get as the Fighting Saints hit their free throws down the stretch and won 75-63. Christian Diego led all scorers with 41 points and Mico Carrion had another strong outing for the Saints scoring 20 points. Takeshi Iso led Bodwell scorers with 15 points. STA will not play Elphinstone tomorrow night at 6:15 at STA. In the double knockout Howe Sound Tournament, STA will need to beat Elphinstone on consecutive nights to take the championship. The elimination game between STA and Collingwood went down to the wire with STA hanging on to win 64-61 in a game that featured numerous lead changes and plenty of 3's! The game was close throughout the first half with neither team able to pull away from their opponent. STA led at the half 34-33 and it was clear that neither team was ready to pack their bags just yet. The Cavaliers came out strong in the second half taking a 7 point lead late in the 3rd quarter before STA went on an 11-0 run to take the lead 53-50 at the end of the third quarter. As the fourth quarter went on STA was able to build a 8 point lead with just over 3 minutes remaining but Collingwood closed it to 3 with just under 2 minutes to go on a 3 from Jordan Narwal. STA was able to make enough free throws down the stretch to seal the deal winning 65-61. The Fighting Saints were led by Player of the Game Mico Carrion (pictured below) who led all scorers with 21 points. Conrad Tomaszkiewicz of STA had 15 points while Jaden Narwal and Jovin Narwal had 16 and 15 points respectively for the Cavaliers. STA will now go on toe play Bodwell tomorrow night. The winner will earn the right to play Elphinstone in the final on Wednesday. 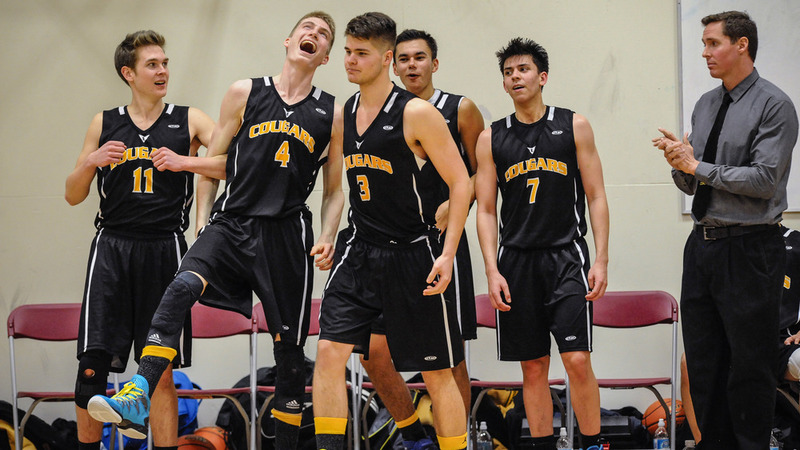 The Elphinstone Cougars dominated the third quarter and cruised to victory in tonight's early game at the AA Howe Sound Championships. The win not only moves the Cougars into the Finals, but it also guaranteed them a berth in the AA Provincial Tournament in Langley later this month. The Cougars took a 37-29 lead to the locker room and built that lead to as many as 20 in the third quarter and never looked back. The Cougars held the Bruins to 17 second half points, wining 68-46. Nate Haglund (pictured below) was in "beast mode" for the Cougars with 20 points and 25 rebounds, Haglund was selected Player of the game for his efforts. Nolan LeWarne finished with 15 points for the Cougars, most of them from long range, and teammate TJ Turenne chipped in with 14. Eric Weng was the lone Bodwell scorer in double figures with 14 points. With the win the Cougars earn a night off while Bodwell will play STA tomorrow night in a sudden death game for the right to play in the final ion Wednesday. 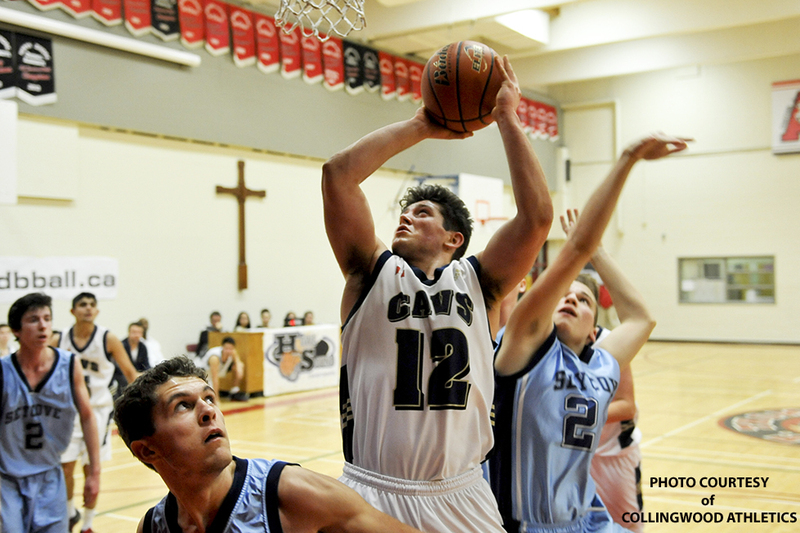 STA got off to a quick start and led 16-3 halfway through the first quarter, but no lead was safe in a tightly fought game on Day to of the AA Howe Sound Championships. Bodwell fought back and closed the gap to 7 points at the end of the first quarter. The Bruins maintain momentum through the second quarter and managed to pull even with the Saints late in the second quarter, but STA hit a 3 at the buzzer to go up 31-27 at the half. Bodwell took and early lead in the third quarter, but the Saints answered with a 13-0 run to go up 12 midway through the third quarter. In a game of small runs Bodwell answered with a 7-0 run of their own to pull to within5 at the end of the third quarter. STA looked like they were going to put away the Bruins early in the 4th quarter, stretching the lead to 9 points before Bodwell once again fought back and it was a 1 point game with a minute and a half to go in the game. Mico Carrion of STA and Patrick Nhamburo of Bodwell exchanged 3's and the game remained a one point game with one minute remaining. Eric Weng hit a clutch 3 for Bodwell down the stretch as the Bruins overcame a number of deficits over the course of the game and won 68-64. Bodwell's Patrick Nhamburo had 26 points to lead all scorers and was selected Player of the Game. Nathan Boppart had 17 points and Mico Carrion had 15 for the Saints in a losing cause. The Elphinstone Cougars got off to a great start scoring 10 unanswered points before Collingwood could get on the board and established a 19-6 lead at the end of the first quarter. The Cavaliers fought back with a barrage of 3's in the second quarter, and closed the gap to 29-25 at the end of the half. The Cavaliers had a strong start after the break and were down only 1 point after the first 4 minutes of the third quarter. Both teams tightened up defensively and scoring was at a premium for the balance of the game. Collingwood was within 5 points with 5 minutes to go but that was as close as they could get as Elphinstone finished strong and won 59-49. The Elphinstone Cougars were led by TJ Turenne with 24 points and was selected Player of the Game. Nate Haglund also had a strong game for the Cougars with 14 points and 18 rebounds. Jovan Narwal and Hunter Welsh once again led the Cavaliers each with 10 points. In the early game the Bodwell Bruins grabbed a 19-2 advantage in the opening quarter and never looked back. Bodwell were led by Player of the Game Jeffry LaRose. Zhibin Li of Bodwell also had a strong game distributing the ball well, resulting in a strong team effort from the Bruins. Howe Sound battled hard through the match but in the end could not close the gap. Bodwell now moves on to play host STA at 8pm tonight. In a match not unlike the early game, the Collingwood Cavaliers jumped out to an early 20-5 lead in the first quarter and coasted to victory in the late game at STA on Thursday night. Collingwood's depth proved to be simply too much for Seycove to handle. The Cavaliers were led by Jaden Narwal who was selected Player of the Game for Collingwood. Collingwood will now go on the face the Cougars from Elphinstone in the early game at STA. Tonight's double header should be exciting basketball at STA. Based on regular season play the remaining teams are very closely matched. With three teams tying for first place it came down to point differential in the games involving those three teams and the Elphinstone Cougars came out on top. St. Thomas Aquinas narrowly edges Bodwell for second place to earn the second bye in hte 2014 AA Howe Sound Championship. The preliminary games are set to take place on Thursday at S.T.A. with Bodwell facing Howe Sound in the early game while Collingwood will play Seycove in the late game. GOOD LUCK TO ALL THE TEAMS IN THIS YEAR'S TOURNAMENT!